Melanie is on the phone realising that Des and Jamie has already left for the airport. Paul realises that they've been so secretive about the party that it's caused them to leave early. As Doug gets a round of drinks in, Dorothy explains that she's going to have to leave early for her dinner date. Helen hopes that Des will turn up as Paul went to so much trouble organising the party. Christina tells Helen how Paul is about to kick Caroline and herself out of the house. Melissa is over to invite Todd over to join her and Cody watching a video for their biology class. He mentions that he's already invited Josh over, but she doesn't look impressed. He tells her to talk to him, but she refuses as he hasn't bothered to contact her. Josh arrives but Melissa disappears before he has a chance to talk to her. Melanie is back on the phone making up a fake story to the airport authorities to try and find out where Des is. Paul hangs up for her, informing her that he's found out which hotel he's staying at, and even has Des' room number. Christina tells Helen how manipulative Isabella is being at that she thinks Paul is making a mistake marrying her. Isabella arrives and Christina makes her escape, Isabella tells Helen about the lies that Christina has been making up, she reckons that Christina is jealous. Dorothy has met with John and they introduce each other as they walk back to the lift, it seems that they admire one another, and he tells her of a French restaurant he has booked for them. Just as they are about to enter the lift, another colleague of his arrives talking of her grandson. As they head down, the lift stops, but with no one answering the emergency phone it would seem they are stuck. The lady tells them the last time it stopped she was stuck for three hours. John decides that perhaps they should open the champagne to pass the time. Josh isn't able to concentrate on the work, and admits he's still in love with Melissa. Todd points out that she won't back down easily, but he'll try to get her round to the house after school the next day. As John and Dorothy chat about their hobbies, the random lady is pleased when the lift starts moving again and decides to walk from the second floor. The other two decide to take advantage of the quiet moment and finish the champagne. 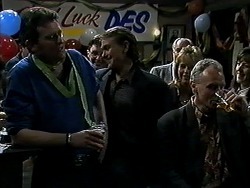 As Des enjoys the company of his friends, he thanks them all for not letting him go without a party. He tells them if they ever come to Perth to give him a buzz. 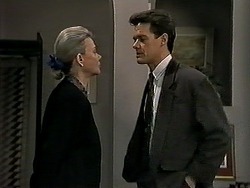 Helen arrives and asks Paul if she can borrow the hotel office for some interviews. He tells her that she can before heading off to the airport. Christina points out that Isabella was all loving last night with Paul, but having just got a call from immigration has now gone cold again. She decides to ring the immigration department. 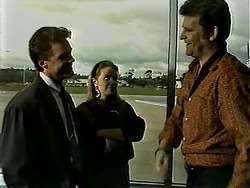 Paul and Melanie say their goodbyes to Des, as he heads for the aircraft. Paul reminds him to send shots of the wedding. Christina informs Helen that Isabella has been trying to get her whole family to come to Australia, but immigration knocked back the application this morning. They reckon that Paul probably doesn't know about this fact and decide to find out more. Melissa arrives, and Josh appears from the kitchen. Todd tells her she's not to go until she's heard him out. He tells her that he's sorry, but she reminds him that Christine was much older than him and everyone is laughing at him. Josh leaves. 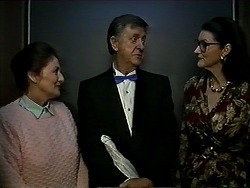 Helen and Christina ask Isabella about her family, but Paul arrives back and tells Isabella that they could get married in two weeks if she likes. She points out that the others aren't too happy about it, but Paul tells them they're getting married in two weeks whether they like it or not.